For a few years now, some time around April we anxiously look forward to a very special package to land (hopefully very gently) on our doorstep. My father-in-law Steve’s home-tapped maple syrup. 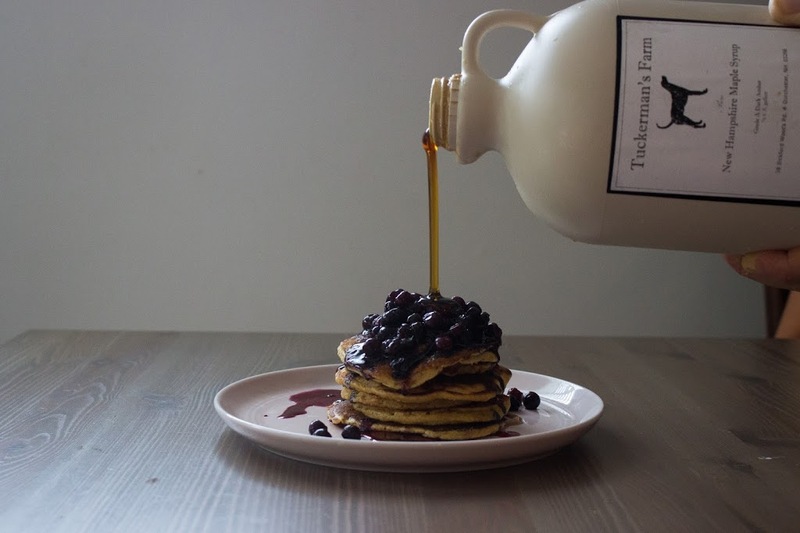 Directly from his farm in New Hampshire – Tuckerman’s Farm. I am so happy to have Steve share this beautiful story with us. Story and photos by Steve Bjerklie. In early March, the sugar maples still sleep in New Hampshire’s woodlands. Winter’s icy shackle clamps the landscape and everything in it with a hard grip. Snow muffles sound, buries life. Winter’s wind is like an archer who never misses the target, which happens to be you, if you’re out walking in the forest. Yet sometime around the middle of the month, a sliver of warmth from the sun sneaks past the cold fortress. A day later, another sliver. A couple days after that, another. One or two more bits of warmth, and the sugar maples shiver awake. Their sap, unseen beneath a coat of gray bark, begins to move. Those slivers of warm sunlight in March or late February signal the beginning of sugaring season in New England. It’s time to tap the maples, time to stack the dry firewood, time to unlock the sugarhouse and fire up the evaporator. It’s time to make the purest, sweetest stuff God ever gave us from a tree. It’s time to make maple syrup. When the afternoon temperatures crawl up into the high 30s or low 40s (F), and the nights drop back below freezing, that’s when the maple sap moves. To reach it, drill a small hole a couple inches deep, insert a metal cone-shaped spout called a spile, and hang a sap bucket from the spile. For centuries, dating back to New England’s earliest settlers, who learned how to make maple sugar from the Micmac and Iroquois tribes, this is how the sap was collected. For many “sugarers,” as maple syrup makers are called, it’s still done this way — it’s how I do it. 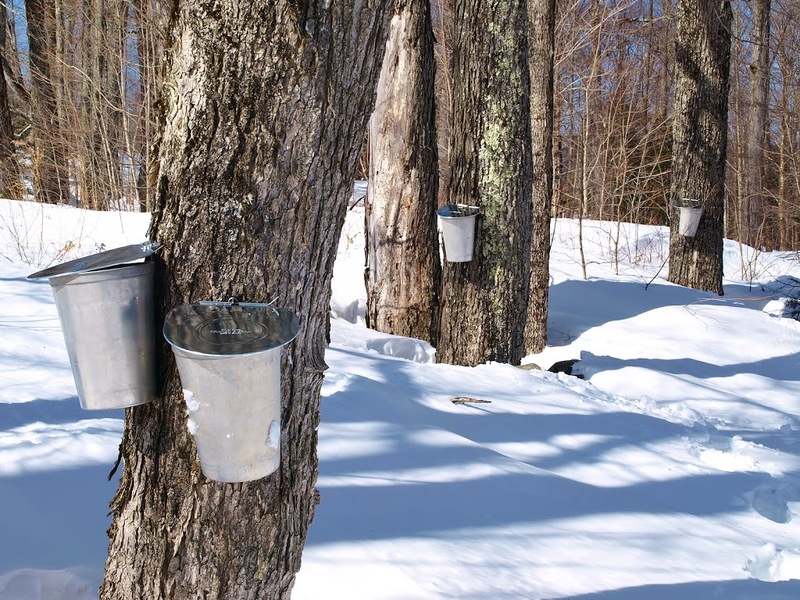 The snow is often deep, the sun is gray and low in the sky, a cold wind gusts just when a sap bucket is hung from a spile hook, but after the bitter months of January and February, going out into the woods to tap maple trees is one of early spring’s great pleasures. It signals the beginning of the end of winter. Sugaring is the bridge between New England’s merciless months and our more forgiving April and May. Sugar maple sap right out of the tree is as clear and fluid as water, but it holds just a hint of sweetness. The old legend is that one day in the early spring an Iroquois chief named Woksis threw his tomahawk at a sugar maple tree and left it there. The next day, he pulled out the tomahawk, and as the day warmed up sap began to flow out of the cut in the tree and pool in a hollowed out log at the foot of the tree. Woksis’s wife needed some water for cooking, and on her way to the stream she found the pool of sap in the log. That night, she boiled the family’s meat in the sap. The village filled with the smell of maple, and the cooked meat was sweet and delicious. Every day after that, Woksis collected sugar maple sap for his wife to cook with. There is a seed of truth in the legend, for Indians in what became the northeastern United States and southeastern Canada boiled sugar maple sap into syrup and maple sugar long before white settlers arrived. From the colonial period well into the 19thcentury, making sugar from sap was common. Maple sugar became a trade commodity, a source of rare sweetness on the frontier. Before the Civil War, abolitionists promoted maple sugar as an alternative to cane sugar, which was produced with slave labor. In 1884, the first patent for an evaporator to more efficiently boil maple sap was issued and production increased. But at the turn of the 20th century the price of maple sugar collapsed, and sugarers throughout New England refocused their efforts on making and marketing maple syrup, which requires less boiling than the sugar (and maple candy). Whether you make pure maple syrup in high volume using the latest technology or whether you are just a backyard hobbyist like me, the process is fundamentally the same. Making syrup from sap involves removing most of the water from the sap to leave the sugar, and that means boiling – and boiling and boiling. The general rule of thumb is that it takes 40 gallons of sugar maple sap to make one gallon of syrup, and in my experience that’s pretty close to right. The residual sweet sap becomes syrup when its temperature reaches 7.2 degrees Fahrenheit above the local boiling point. 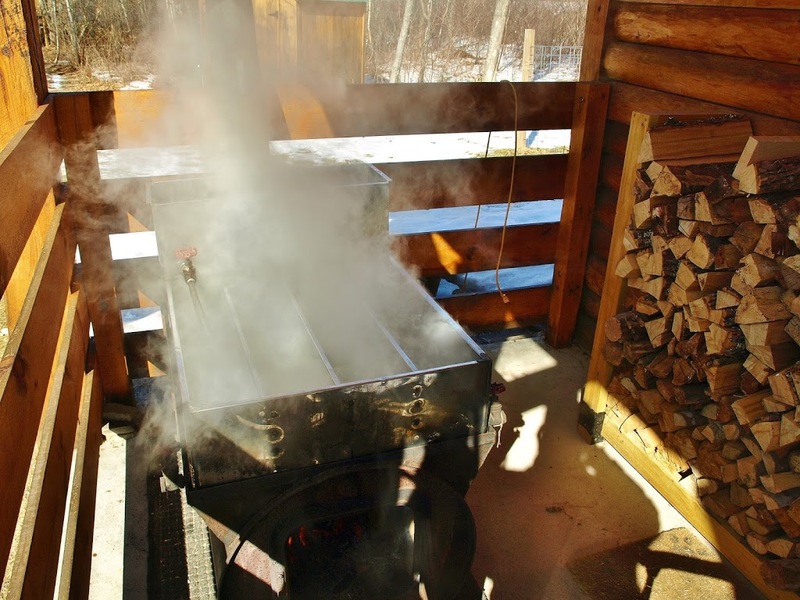 An evaporator is the essential tool for boiling sap to remove the water. It’s basically a wood stove topped with a shallow stainless steel pan that’s divided into channels. As the sap boils in the pan, it moves from channel to channel, becoming sweeter and sweeter with time and boiling. 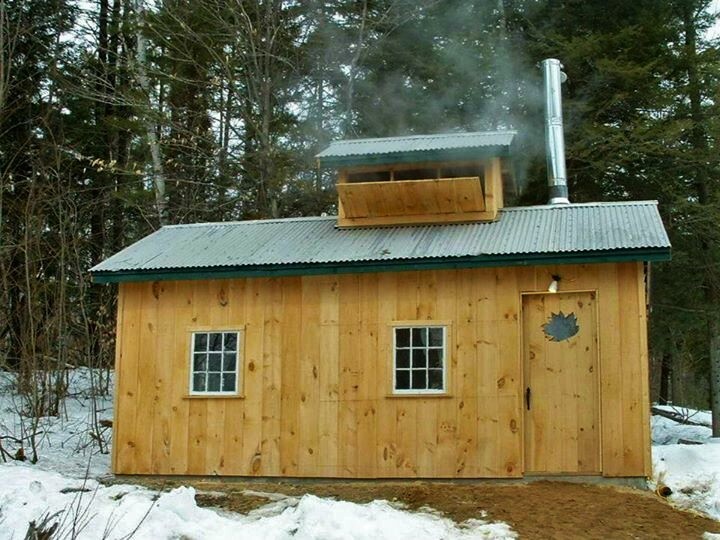 Fancy evaporators can cost thousands of dollars and will boil dozens of gallons of sap down to syrup in an hour or less, and there are evaporators available that are fueled by oil or wood pellets or even coal, but firewood, which is super-abundant in well-wooded New Hampshire, is the most commonly used fuel in evaporators. Some high-end sugarers run their sap through a reverse osmosis machine to remove a portion of the water before boiling it in the evaporator. These sugarers also typically use a system of tubes and vacuum pumps to collect sap by the hundreds of gallons rather than the old-fashioned, but labor-intensive, approach with spiles and buckets. On the other end, some backyard sugarers build their own evaporators from cinder blocks and barbecue grates, and boil their sap in big metal pots. That’s how I started. It’s inefficient compared to boiling on an evaporator, but boiling the old way still carries the romance and history of long-ago sugar-making. The evaporator I use these days was made from a 55-gallon oil barrel sliced open down the side to create an opening to hold the boiling pan. The inside of the barrel is lined with fire brick, and a thick metal door on one end of the barrel gives me access to the firebox; the other end is cut for a smokestack. I can boil about three or four gallons of sap per hour on this rig, feeding the fire in the barrel almost constantly with dry wood. (Another rule of thumb: Depending on the efficiency of the evaporator, it takes about one full cord of firewood – that’s a stack of firewood four feet high, four feet wide, and eight feet long – to boil 400 gallons of sap.) One of these years I’ll upgrade to a more efficient evaporator, but for now the system I use works fine. I’ve been asked: Why not just boil the sap on the stove in the kitchen? That could work, but most stove burners at home don’t get hot enough to boil sap quickly. Not only that, but boiling sap produces thick clouds of hot steam, so unless you want the wallpaper to peel and all the art on your walls and all the furniture in your rooms to get soaking wet, boiling in the kitchen is not a good idea. Where you want to boil is in a sugarhouse. A sugarhouse can look like almost anything – a garage, a log cabin, a barn or a shed – but they all share one thing in common: a roof that vents open to allow the steam from the evaporator to escape. A drive along the backroads of New England in March or early April will discover dozens of sugarhouses back among the trees or in backyards, big clouds of steam billowing from the vents. When sap is boiling, the quiet, woodsy countryside smells just like breakfast – like warm maple syrup being poured over pancakes. 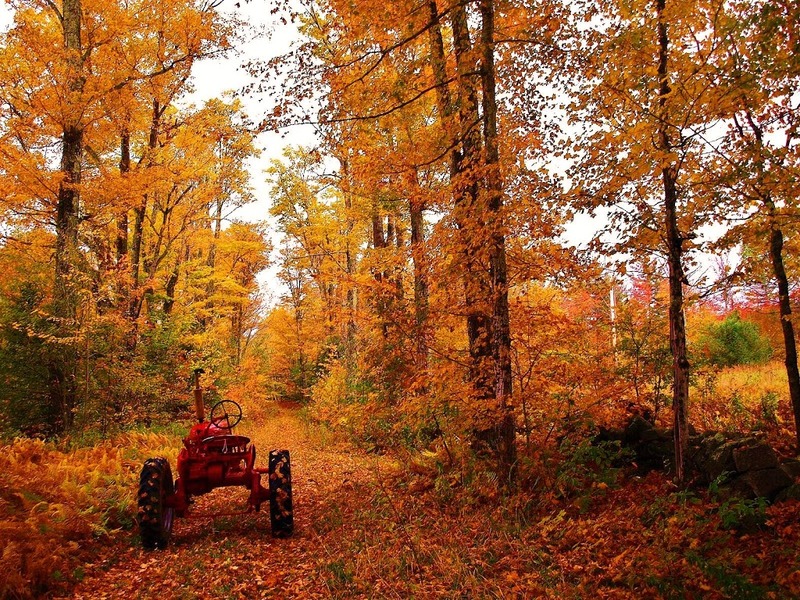 Most of the sugar maples I tap for our syrup are more than 100 years old. They belonged to a commercial sugarbush (what a sugar maple farm is called) that was operated by a local family for decades. When we bought the property, now named Tuckerman’s Farm, several years ago, the old sugarhouse, which had huge, thick beams that had been hand-cut with an axe, was still standing, but then a heavy winter snow one year brought it down before the sugarhouse could be restored. The old maples hadn’t been tapped in decades, and when I drilled the first small tap holes one warm March afternoon a few years ago, the sap practically poured out. 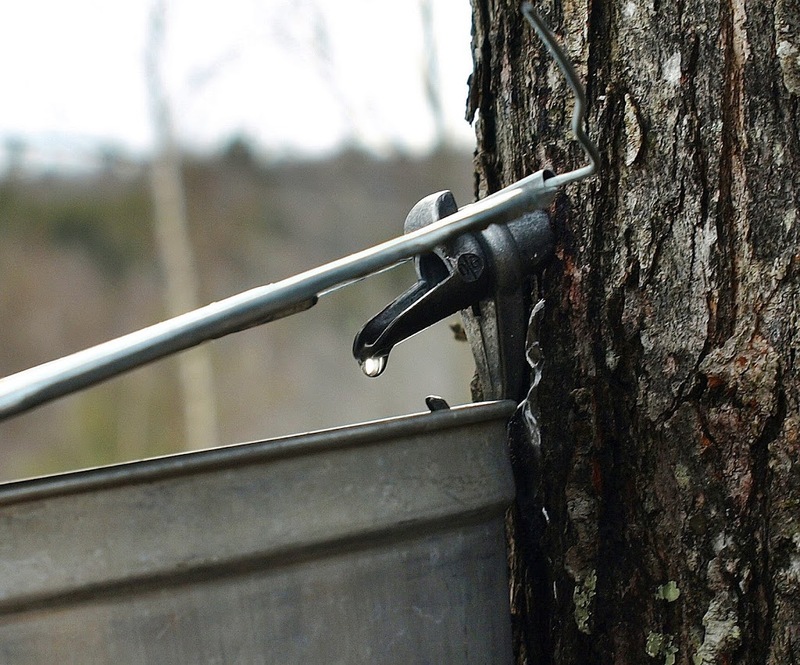 Tapping trees doesn’t hurt them, by the way; the tap holes are small and quickly grow over, and the amount of sap taken from a tree to make syrup is miniscule compared to all the sap a healthy maple tree holds. Sugar season ends when nights become warmer than freezing and leaf buds begin to appear on sugar maple branches. The sap stops flowing, and to underscore that fact there’s one more sugarer’s rule of thumb: When the first chirps from the tiny frog called a spring peeper are heard, sugar season is over. Some years the season is weeks long, other years it’s just a few days. This year’s sugaring season arrived in two parts: first, one week of excellent conditions, then a three-day deep freeze, then three days of too much warmth, then another three days of great sap flow. After that, the peepers started singing. Perhaps I’m being overly romantic or sentimental, but I feel like the beautiful, majestic old sugar maple trees on Tuckerman’s Farm and I are partners in our little syrup enterprise. The trees give me their sap in the early spring; in the summer, I keep them clear of pesky undergrowth. The wise old trees I tap seem to hold a story, a mystery, I can’t quite understand or unravel, and that’s okay. These trees have seen, browsing beside their sturdy trunks, moose and black bear, white-tail deer and silver foxes. They’ve seen cattle and sheep. They’ve seen wagons and then sedans and then flashy pick-up trucks and now my old red tractor. On a blustery early spring afternoon, when the sunlight slants like an arrow and I am tromping through the snow collecting sap from the buckets, the trees feel like old friends, but they still keep most of their secrets. The only secret of theirs I know for certain is the sweetest one, however.